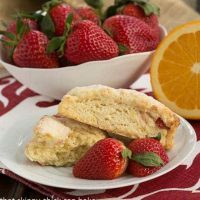 These Strawberry Buttermilk Scones prove that you don’t need cream to create tender, moist scones! Preheat oven to 425°F. Stir flour, sugar, baking powder, baking soda, and salt together with a fork. Add butter pieces and work it into the dry ingredients until mixture resembles coarse cornmeal. Pour in 1 cup buttermilk and the zest, and mix until ingredients are just moistened. If the dough seems dry, add another tablespoon buttermilk. Gather dough into a ball, turn it onto a lightly floured work surface, and knead briefly. Cut dough in half. To Make Triangular-Shaped Scones, roll one piece of dough into a ½-inch-thick circle that is 7 inches across. Brush the dough with half of the melted butter, sprinkle with 2 tablespoons of sugar, and cut the circle into 6 triangles. Place the scones on an ungreased baking sheet and bake scones 10 minutes or until golden. Remove to a wire rack to cool.